The Grange celebrates Pete Seeger’s Birthday Centennial with a concert by two fantastic musicians who carry on the tradition of music with a message. Stand Up & Sing! Workshops, classes, chorus singing and more celebrating the 100th birthday of Pete Seeger through song. For kids ages 7-12. Afternoon performance open to all! Join the world-wide celebrations of Pete Seeger’s 100th birthday in this joyful community event. The incomparable Tony Trischka comes to the Grange. Celebrating Pete Seeger’s 100th Birthday! The beloved story of Simba in the African Pride Lands, with live music! Presented by the Depot Theatre’s BRTF Youth Theatre Program. A horror-comedy rock musical from the Depot Theatre’s BRTF Youth Theatre Program. With live music! An afternoon of great bluegrass music from the SUNY Plattsburgh student band. Bring your instruments and voices! Swing your sweetie or just come and listen to the great sounds of The Steady Benders! Join Scrooge, the ghosts of Christmas and your friends and neighbors for this holiday tradition! 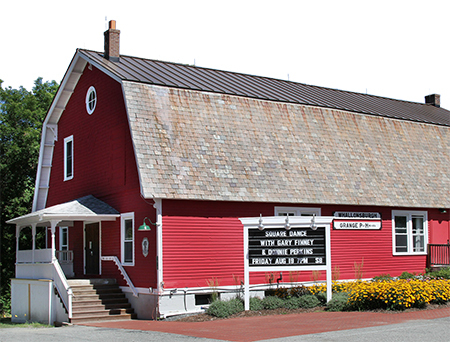 A great evening of music as the North Country’s favorite bluegrass band returns to the Grange. With the rich vocabulary of traditional Irish melodies, lightboxes and video animation, this extraordinary fiddle/guitar duo bring their latest project, "The Coral Suite": a poem for coral reef ecosystems, to the Grange. The Boquet River Theatre Festival Senior production is a hilarious comedy about . . . THEATRE! Roald Dahl's timeless story of the world-famous candy man and his quest to find an heir is a golden ticket to adventure. Presented by Boquet River Theatre Festival. Michael Glabicki and Dirk Miller return to the Grange! An intimate evening of uplifting and danceable music from these fantastic performers from Rusted Root. 3rd Thursday of the month jam session led by Jeremy Clifford. All levels welcome. Tuesdays With Morrie, presented by the Adirondack Stage Rats. Smash hit play based on the best-selling book full of love, laughter and life’s lessons. Calling all young actors! Auditions for Willy Wonka, the BRTF junior play, and for the TBD senior program are coming up! Swing into SUMMER for a great cause! Dinner and dance will benefit James Graves and Full & By Farm as James recovers from an accident in April. Beautiful harmonies, three fiddles and a piano. Direct from Scotland to Whallonsburg on their first US tour! One night only! Dan Berggren, John Kirk, Trish Miller, Peggy Lynn, and Dan Duggan together on stage at the Grange. Low Lily explores the roots and branches of American folk music with traditional influences and modern inspiration that weaves together a unique brand of acoustic music. Bluegrass and country music from one of the best known North Country bands. First time at the Grange! TICKETS AVAILABLE AT THE DOOR!. We are very proud to bring Scotland's best-known folk musician, Archie Fisher, back to our stage. The Adirondack Shakespeare Company presents this hilarious Shakespearean comedy that forces gentlemen in love to keep love at arms’ length. Three of the most soulful and engaging performers in the singer/songwriter world today join forces and create incredible music.